Hello all. I know it's been a while (over a month - *gulp*) since I last wrote a blog post. I have been busy buying up the whole world (AKA shopping for Christmas). 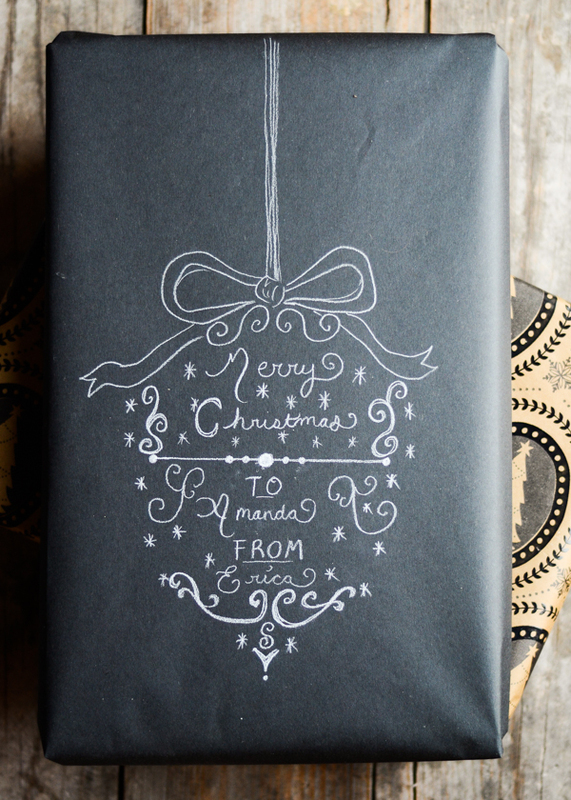 Ever since I saw chalkboard wrapping paper on Pinterest I knew I needed some for myself. 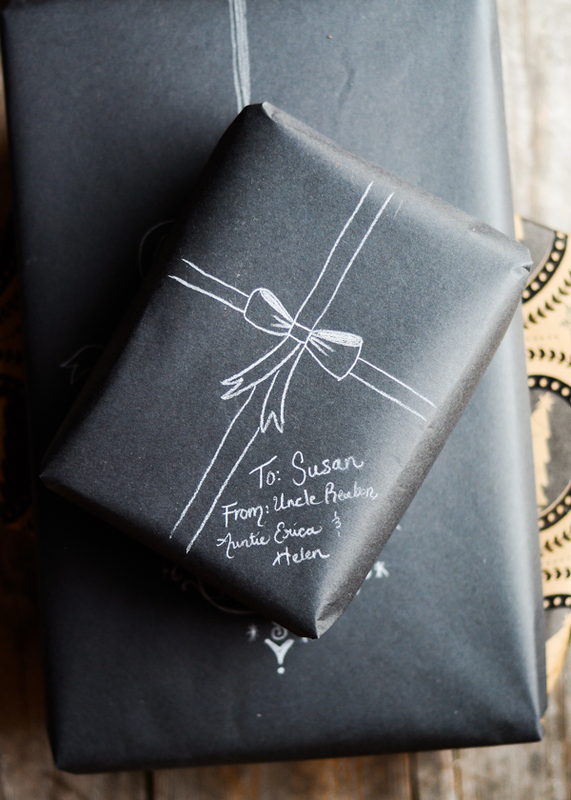 So when Terrain had an awesome Black Friday sale, or course I had to buy some of their black kraft wrapping paper. I believe they're sold out now, but you can still find it on Etsy HERE. 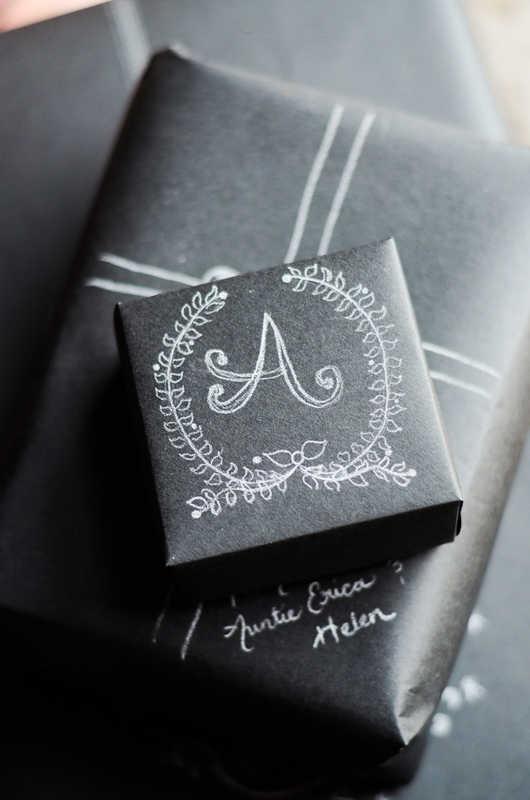 I used a white charcoal pencil to draw my designs. Here are a few of my favorites. Please don't make fun of my (horrid) wrapping skills. I think I'm the most proud of this one. I used this chalkboard sign from Etsy as inspiration. A tiny bow for out little niece Susan. Inspiration from this post by Going Home to Roost. 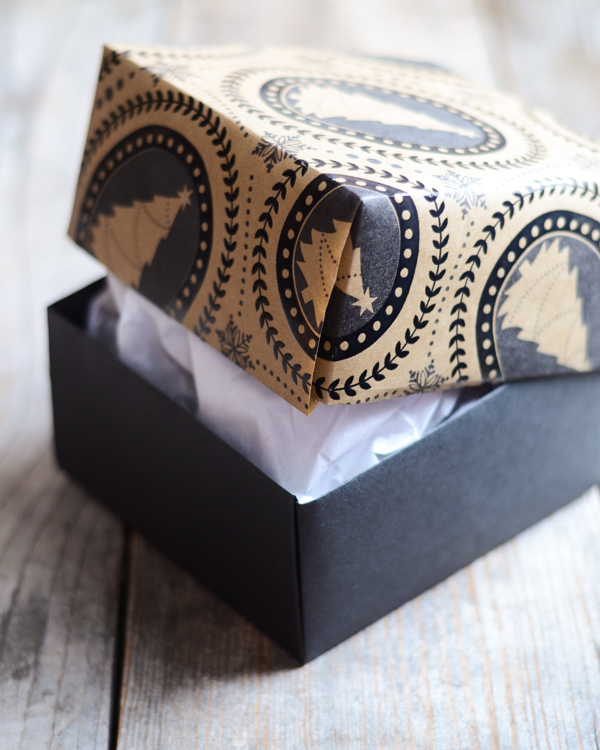 I made an origami box (more on that below) and used this free wreath printable as inspiration. This is another one that I'm quite happy with. I used this photo from Pinterest as inspiration. I couldn't find a box the proper size for a gift for my older sister, so I made an origami one. HERE is the tutorial I used. 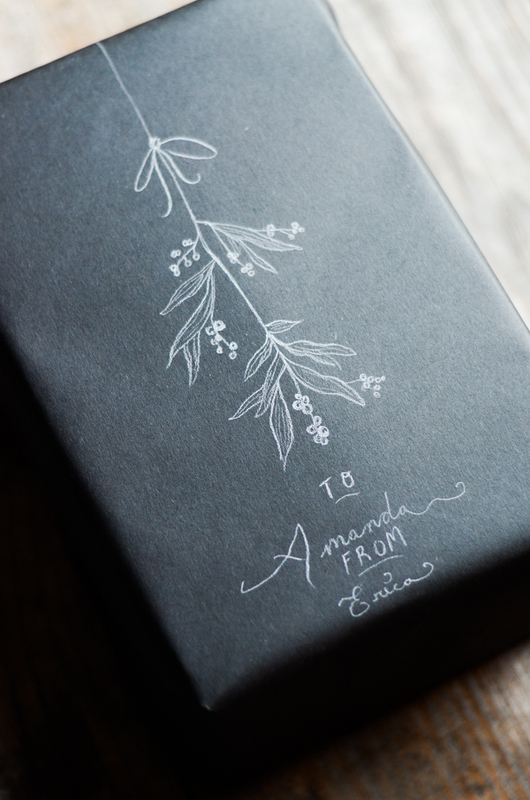 I used some wrapping paper that I had leftover from last year as the lid, and chalkboard paper as the bottom. It's a tiny bit lopsided, but I'm happy with the end result. 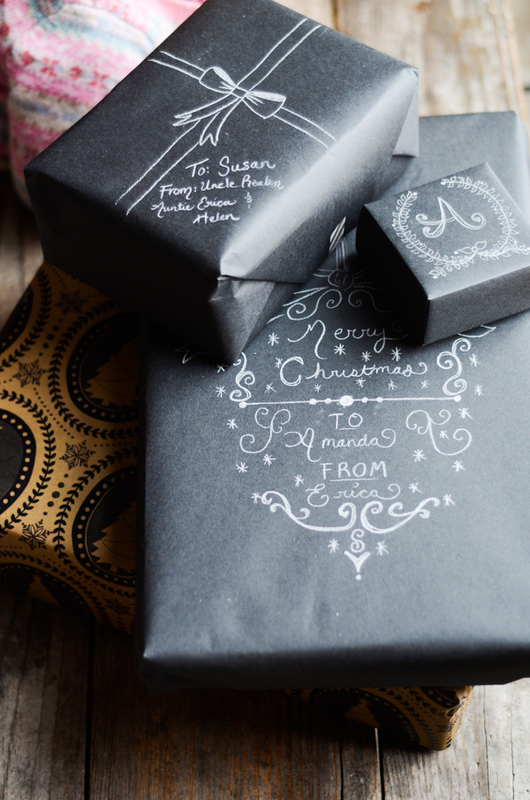 Buy the wrapping paper HERE. Find the origami box tutorial HERE. Use a charcoal pencil for drawing. Search on Pinterest for design inspiration. 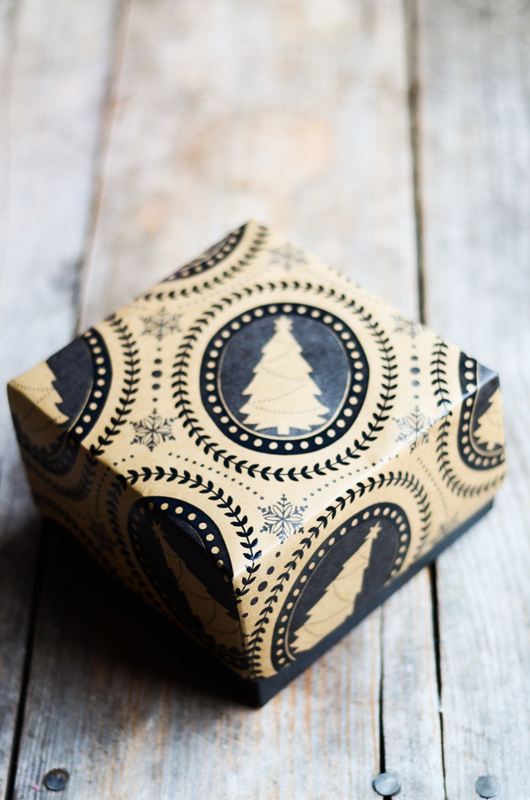 What are YOU doing for gift wrap this year? I am in awe. What a great idea. You draw an excellent bow. And it's nice to see your blog post--you are a busy mom. Aw thanks, Mimsie! I'm not very good at drawing "off the top of my head" -- I need a reference. :) Hope you have a Merry Christmas! What Joy to receive gifts like these! Happy Christmas to you a your's from me! Oh, congratulations! Hope your labor goes as smoothly and with as little pain as possible. What an amazing Christmas gift! May you and your family have a very Merry Christmas as well, Anna!